Many fungi make a living by drilling networks of filaments into pieces of wood. Parasitic fungi infect and feed off of living trees, while saprobes take up residence after a tree dies and contribute to its decay. A subset of wood-inhabiting fungi produce pigments, compounds that serve a useful purpose (e.g. warding off competing fungi or wood-eating insects) and happen to be coloured due to their particular molecular structure. Colour changes in wood brought about by fungi are collectively known as spalting. Forms of spalting include bleaching, zone lines and diffuse staining. Bleaching refers to white patches produced by a particular group of white rot fungi as they selectively break down lignin, the component of wood responsible for its brown colour. Zone lines are dark meandering lines thought to be the result of two fungi colonizing the same piece of wood and engaging in fungal fisticuffs (e.g. producing defensive clumps of melanin-rich filaments) where they encounter one another. Diffuse staining (e.g. pink/red, yellow, and blue-green) is due to intensive pigment production by a fungus as it colonizes wood. As it is highly valued by woodworkers for its pleasing appearance, spalted wood can fetch a good price at specialty lumber stores. Given the opportunity for commercialization, there's interest in developing a means of producing spalted wood on a large scale. Spalting can be induced by introducing previously grown cultures of a pigment-producing fungi to a piece of wood (e.g. spraying on liquid cultures) and then placing the wood (e.g. a recently cut log) in a controlled environment to ensure optimal temperature and humidity conditions for fungal growth. Unfortunately, this process can take several months, so it isn't particularly amenable to making a lot of money. An alternative approach to achieving diffuse wood staining is to grow cultures of a fungus using a special media containing particles of rotted wood to ensure high levels of pigment production, collect the pigment using an organic solvent (e.g. dichloromethane), and strain a piece of wood with the resulting solution. Fungal pigments can also be used to dye textiles and various other materials. Since many wood and textile dyes are produced using crude oil, a limited resource, it's exciting to have a renewable dye source. Examples of spalting fungi include Trametes versicolor, Scytalidium cuboideum, Scytalidium ganodermophthorum, and Chlorociboria aeruginosa. Trametes versicolor is a wood-bleaching white rot fungus perhaps better known as the turkey tail. The concentric zones of various shades of brown, yellow-brown, and red-brown on the upper surface of its fan-like fruiting bodies (mushrooms) resemble the fanned out tail feathers of a turkey. The fungus is a common resident of forests throughout Canada and the US. In addition to whitening wood, T. versicolor produces zone lines when paired with Scytalidium cuboideum, another North American inhabitant of rotting logs and stumps. Completing the aforementioned spalting triumvirate, S. cuboideum (previously called Arthrographis cuboidea) produces a diffuse pink stain as it grows through wood. Although pigment production by S. cuboideum is curbed when it interacts with other fungi, it's been reported as the cause of a pink stain in most North American trees used for lumber. Among the weirder places it's been found are rotting mine timber in Johannesburg and wood treated with sodium pentachlorophenoxide (intended to prevent staining by inhibiting microbial growth). Scytalidium ganodermophthorum, in addition to being a mouthful, is a saprobe/mycoparasite responsible for the yellow rot of Ganoderma lucidum. As you might have guessed, it can stain wood yellow. G. lucidum (also called lingzhi or reishi) is a famous medicinal fungus, making an appearance in the traditional medicines of China, Japan, and Korea. It produces large and shiny mushrooms and is consumed for its health benefits, which may include inhibiting cancer cell growth, regulating blood glucose levels, boosting the immune system, killing bacteria and viruses, and protecting the liver from damage. S. ganodermophthorum is a major pest in areas of Korea where G. lucidum is cultivated using oak logs in greenhouses. It reduces mushroom yields and causes the formation of deformed mushrooms, their stalks and the logs from which they sprout both taking on a greenish yellow colour. It's only recently been explored for its ability to stain wood. Chlorociboria aeruginascens is a tiny blue cup fungus found in North America and Europe. 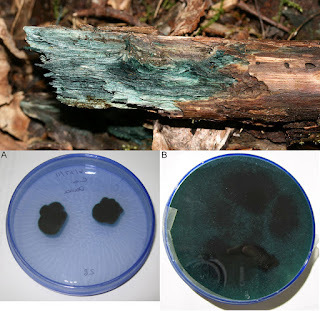 It puts together and releases a pretty blue-green pigment called xylindein as it grows through wood. Although the fungus doesn't often make cups (from which it releases spores), its presence is otherwise denoted by the blue-green staining of the wood in which it resides (usually well decayed hardwood logs). Interestingly, it tends to stain poplar and sugar maple trees to a greater extent than birch or basswood. Wood stained with xylindein by Chlorociboria has been used to create wood inlays (fitting together nice looking pieces of wood onto the surface of a larger object such as a cabinet), examples of which include intarsia panels created during the Italian Renaissance (e.g. the Gubbio studiolo) and Tunbridge ware produced in the town of Tonbridge during the 19th century. Blanchette RA, Wilmering AM, Baumeister M. 1992. The use of green-stained wood caused by the fungus Chlorociboria in intarsia masterpieces from the 15th century. Holzforsch 46(3):225-232. Golinski P, Krick TP, Blanchette RA, Mirocha CJ. 1995. Chemical characterization of a red pigment (5,8-dihydroxy-2,7-dimethoxy-1,4-naphthalenedione) produced by Arthrographis cuboidea in pink stained wood. Holzforschung 49(5):407-410. Sigler L, Carmichael JW. 1976. Taxonomy of Malbranchea and some other Hyphomycetes with arthroconidia. Mycotaxon 4:349-488.